Well Known Farmer Of LaGrange Township had been Ill Over A Year. Mr. Ingels was taken sick a year ago last October with a general breakdown and was confined to his bed for the last four months. He displayed remarkable vitality, although his death had been expected for several weeks. Mr. Ingels was born Oct. 11, 1833 in Meigs County, Ohio. His father Anson Ingels came to Bond County in 1854 and located on the old Ingels homestead northwest of town. When the Civil War broke out, Ingels enlisted in Co. B. 22d Illinois Infantry and served three years and one month. 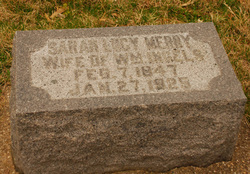 On December 27, 1865 he married Sarah Lucy Merry. They went to housekeeping on the farm they have lived all these years and where Mr. Ingels died. Mr. Ingels is survived by his wife and one son Anson. A daughter died at the age of 11 months, Sept. 18, 1867. He is also survived by one brother, Charles Ingels of Greenville and by one sister, Mrs. Sarah Merry of northwest of Greenville. They are the only ones left of the original Ingels family of nine children. Mr. Ingels was a member of Colby Post, G.A.R. of this city. He was a man held in high esteem by his many friends and acquaintances. Funeral services will be held at the residence at 2 o'clock p.m. Tuesday by Rev. W.E. Wise.